Paphiopedilum or "Lady Slipper" orchids are among the easiest candidates for transplanting. They transfer to Hydroponics without incident. 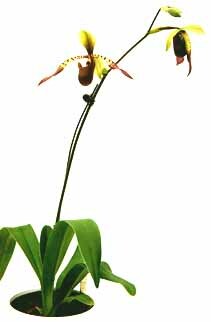 Our system is a natural for both Paphiopedilum and Pragmipediums. In nature their roots amble along the forest floor, prefering the evenly moist environment of decaying leaves and other compost. Our Hydroponic System creates an even balance of air and moisture as the pebbles deliver the nutrient solution to the roots. What could be better! Water to 1/2 on gauge. 1/2 is middle line on indicator. When indicator reaches "Min", rewater to 1/2. Light: Bright light but avoid hot sun. Temp: These orchids can be divided into two groups: motled leaves which need warm temperatures and, green leaves which prefer cool temperatures. Water: Paph's like continuous moisture. Water to 1/2 on gauge. When the indicator reaches the "Min" level, rewater to 1/2.